Bathroom Tiles San Fernando - The Worst Choice for Your Bathroom Floor? 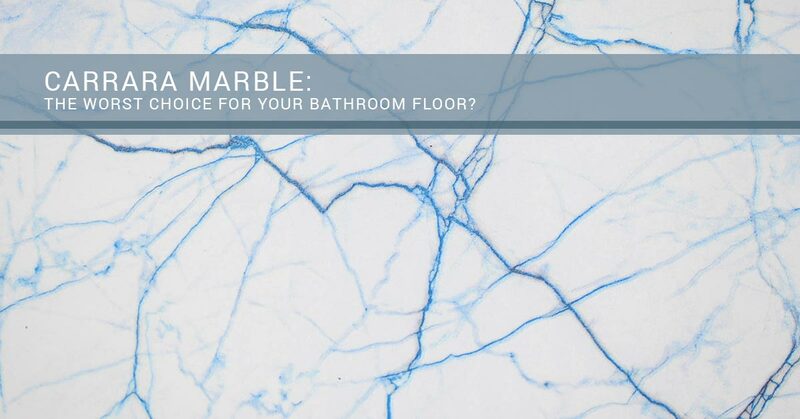 Carrara Marble: The Worst Choice for Your Bathroom Floor? When you think of marble, what comes to mind? Do you imagine a master craftsman installing marble across a palace floor? Our team at Transworld Tile certainly agrees that the aesthetic value of marble is one of the highest in the flooring industry. Nonetheless, it may be wise to consider whether or not it’s the best choice for your bathroom. You may be wondering, “Why would a tile company steer me away from a more expensive product to offer something else?” Our answer to your question is because we care. 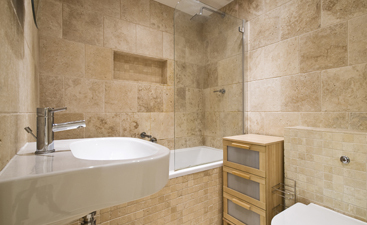 We want you to get the best flooring product you can for your bathroom. However you feel about marble in your bathroom, we simply want to offer some insight and advice when it comes to using marble. If we examine a trend we’re seeing around the world, you may reconsider the use of marble, or it may reinforce your desire to choose the majestic material. The attraction to marble is in its inconsistent appearance. The veining and color variety tends to be heralded as its best trait. Nonetheless, marble is a metamorphic rock; it’s undergone changes under heat, pressure, and other natural causes, which contributes to its fascinating aesthetic appearance from piece-to-piece. Marble tile tends to remain more uniform in its display along with a more consistent color palette and gentler veigning, which creates an elegant look and feel. You can also find bold or more pronounced coloring and veining in marble, which offers a less uniform but more unique look. When it comes to quality of marble, professionals will tend to agree that the closer the marble originated to Greece, the better it will withstand a more humid or moist environment. Also, higher iron content is indicated by the amount of veining. If there is more veining, you will tend to find the marble appearance to slowly change over time. 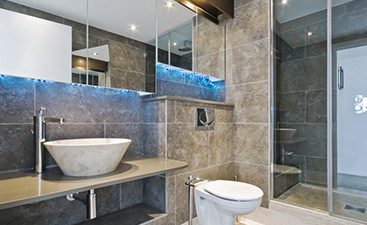 Even though marble is a majestic material, it does pose some negatives when used in a bathroom. The material is soft, which means it’s absorbent. Lotions, liquids, and other acidic in nature products can stain the stone permanently and affect its lifespan. The primary pro is how easy the material is to work with. The soft stone is easy to tumble, machine, mill, or otherwise, to achieve the desired shape or style for your project. Marble is considered a diverse-use stone because of its softness. Large pieces like flooring and countertops and smaller pieces like backsplash or crown molding can all be made out of marble. Marble contains minerals, which means the risk of rust in your shower is possible. Although this doesn’t happen very often, it’s something to consider before purchasing an entire unit of marble for your bathroom. If you’re concerned about the marble’s potential to rust in the shower, consider soaking it first. Take a single piece of marble and take a photo of it. Then, submerge it in water for at least 48 hours. Finally, let the marble piece dry out for another 48 hours. Examine the material for any visible changes like rust, vein alterations, or color changes. This is a basic test to see if the marble you’re about to purchase is exactly what you want, since it will change over time, especially if it’s continuously getting wet and drying. Many homeowners don’t realize that marble is a high-quality product which requires regular maintenance, more than your high-quality porcelain tile, which looks extremely similar to marble. It’s best to make sure your marble is sealed. This reduces water’s effect on the marble’s aging process over time. Ensure the sealant is not on the edge of the marble, so that the bond between the marble and grout is not compromised. Otherwise, you can either rinse the marble yourself with soap, water, and a soft nylon scrub, or hire a professional to clean it for you on a regular basis. Carrara Marble is a wonderful addition to any home. The design and style of the marble adds a unique feel to the space. However, if you’re willing to maintain the marble, Carrara marble could be a great addition to your bathroom. 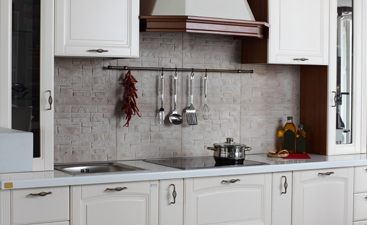 Shop Online for Carrara Marble Online Now! When you’re looking to purchase any kind of marble, make sure you’re buying from a reputable, high-quality source. The worst feeling in the world is to purchase what you think is great marble only to find out it’s low-quality. At Transworld Tile, we’ve been serving our customers’ Carrara Marble needs for more than 30 years. If you’re looking for the best Carrara Marble for your bathroom, give us a call today!